Replacing your Firebird Trans Am headliner and sun visors will vastly improve the interior of your car in an afternoon! 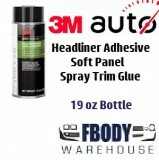 We offer a full line of replacement headliner materials, trim, and fully assembled headliners for you F-body! Items specifically produced for your 1993, 1994, 1995, 1996, 1997, 1998, 1999, 2000, 2001, 2002 Firebird Trans Am with standard or deluxe interior!